Can identify the building blocks of a feature method. Can use these building blocks when we write feature methods. A feature method describes the expected behavior of a feature that is implemented by the system under specification. We can name our feature methods by using String literals, and this is a huge advantage over JUnit 4 (or TestNG) because we can (and we should) use sentences that actually make sense. The setup block must be the first block of a feature method and it contains the configuration of the described feature. A feature method can have only one setup block. The when and then block describes the stimulus (when) and the expected response (then). A feature method can have multiple when and then blocks. The expect block describes the stimulus and the expected response in a single expression. A feature method can have only one expect block, and it is possible to add both when and then and expect blocks to the same feature method. However, this is not very practical. 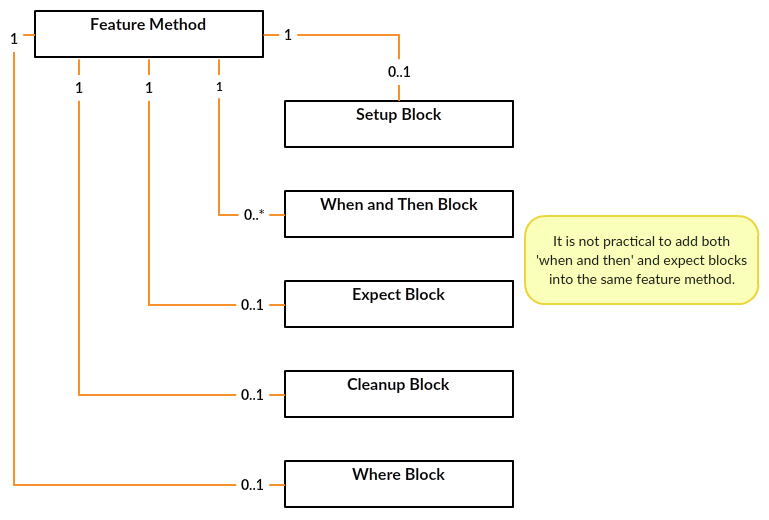 The cleanup block is used to clean up the resources used by a feature method, and it is invoked even if the feature method throws an exception. A feature method can have only one cleanup block. The where block must be the last block of a feature method, and it is used to write data-driven feature methods. A feature method can have only one where block. This lesson helps you to use setup, when and then, expect, and cleanup blocks. We will talk more about the where block in the next lesson of this topic. We can now identify the blocks of a feature method. Let’s move on and find out how we can use these blocks when we write feature methods. During this lesson we will learn to use these blocks when we create a feature method which specifies the expected behavior of the get() method of the HashMap class. Let’s start by finding out how we can use the setup block. As we remember, the setup block is the first block of a feature method and we can use it for configuring the described feature. The setup block has an optional label (setup or given) and we can create an implicit setup block by omitting that label. If we want to write our feature methods by using the given-when-then format, we can replace the setup label with the label: given and describe our setup block by using a String literal. After we have configured the described feature, we have to specify the expected behavior. Let’s find out how we can do it by using when and then blocks. We can specify the expected behavior of the described feature by using when and then blocks which always occur together. The when block describes the stimulus and the then block describes the expected response. A when block must start with the label: when. A when block can have an optional description that is given by using a String literal. A when block can contain any code. A then block must be placed right after the when block that describes the stimulus. A then block must start with the label: then. A then block can have an optional description that is given by using a String literal. A then block can contain only variable definitions, conditions, exception conditions and interactions. As we remember, a feature method can have multiple when and then blocks. Let’s create another when and then block which verifies that the get() method of the HashMap class returns null if no value is found with the given key. When we take a closer look at our feature method, we notice that the when block seems a bit artificial. Let’s clean up our feature method by using the expect block. An expect block must start with the label: expect. An expect block can have an optional description that is given by using a String literal. An expect block can contain only conditions and variable definitions. Our next step is to verify that the get() method of the HashMap class returns null when no value is found with the given key. Because a feature method can have only one expect block, we can “divide” that block into several parts by using the and label. The and label is used to describe individual parts of a block, and it has an optional description that is given by using a String literal. It should be clear that we can specify the expected behavior by using either a when and then or an expect block. The question is: how can we choose the right tool for the job? As a guideline, use when-then to describe methods with side effects, and expect to describe purely functional methods. We can now specify the expected behavior of the described feature by using both when and then and expect blocks. This is a good start, but sometimes our feature method reserves resources that must be freed afterwards. Let’s find out how we can clean up these resources by using the cleanup block. A cleanup block must start with the label: cleanup. A cleanup block must be placed after the when and then and/or expect blocks. Let’s assume that we have created a feature method which creates a new file. Naturally we want to delete the created file after the feature method has been finished successfully or after an exception has been thrown. Because the cleanup block is invoked even if the feature method throws an exception, we must write our cleanup block by using defensive programming because we cannot know which line throws the exception. We can now identify the blocks of a feature method, and we know how we can use these blocks when we write feature methods. Let’s summarize what we learned from this lesson. A feature method consists of blocks. The setup block configures the described feature. The when and then block describes the stimulus and the expected response. The expect block describes the stimulus and the expected response in a single expression. The cleanup block is used to clean up the resources used by a feature method. We can describe individual parts of a block by using the and label. This is a free sample lesson of my Test With Spring course. If this lesson helped you to solve your problem, you should find out how my testing course can help you.